A beautiful smile is made even more so by good oral health! TMA members can smile about the excellent dental benefits that are available from MetLife through TMA Insurance Trust. Perhaps you aren’t covered by your employer plan or do not have adequate coverage for your needs and are looking for dental coverage for yourself and your family. Or it may be that you need to provide dental coverage for staff members in your medical practice. Whatever the case, TMA Insurance Trust can provide you with members-only options to fit your situation. Through TMA Insurance Trust, members who choose the MetLife dental plan have access to an expansive network that includes over 300,000 dental locations. But your choices don’t end there; you have the freedom to choose any dentist², even ones who are out-of-network. Have questions about your insurance needs? The MetLife dental plan can help reduce out-of-pocket costs, with affordable premiums and low co-pays. Receive 100% coverage on in-network preventive care, including cleanings and oral exams; and enjoy typical savings of 30-45% on covered dental services when you use an in-network dentist.¹ Even if you choose to go out of network, you will still enjoy discounted group rates. Our advisors do not get paid a commission, so there is never any obligation. Our only goal at TMA Insurance Trust is to serve and support you as a TMA member, helping you find the right insurance options for your particular needs. If you have questions about the MetLife dental insurance plan, reach out to us today. 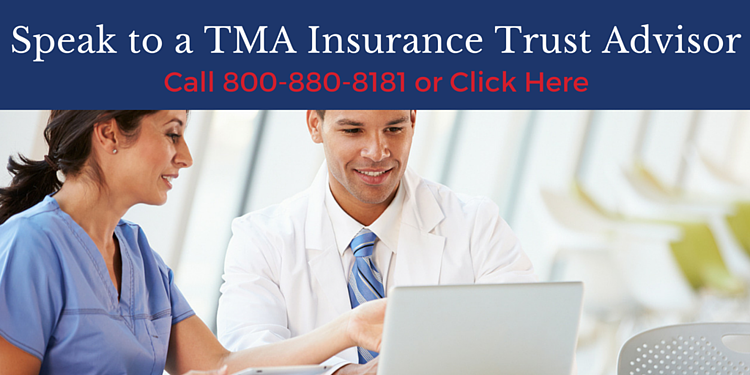 For over 60 years, TMA Insurance Trust advisors have been serving Texas physicians, their families and staff. TMA Insurance Trust prides itself on offering unbiased information and strategies to members, along with exclusive group rates on a range of the highest-rated plans in the industry. Want to speak to an advisor? Complete the form below and we will reach out shortly. *R.D. (2000). Neural correlates of conscious emotional experience. In R.D. Lane & L. Nadel (Eds. ), Cognitive neuroscience of emotion (pp. 345–370). New York: Oxford University Press. ¹Based on internal analysis by MetLife. Savings from enrolling in a dental plan will depend on various factors, including how often participants visit the dentist and the costs for services rendered. ²Your out-of-network costs may be greater when you visit a dentist who does not participate in the MetLife network. Coverage may not be available in all states. Please contact TMA Insurance Trust toll free 1-800-880-8181 for more information. Rates may be changed on the entire TMA Insurance Trust plan or on a class basis and on any premium due date on which benefits are changed. A class is a group of people defined in the TMA Insurance Trust policy. Benefits are subject to change upon agreement between Metropolitan Life Insurance Company and the participating organization. TMA Insurance Trust incurs costs in connection with providing oversight and administrative support for this sponsored plan. To provide and maintain this valuable membership benefit, MetLife may compensate TMA Insurance Trust for these and/or other costs. Like most insurance policies, insurance policies offered by MetLife and its affiliates contain certain exclusions, exceptions, reductions, limitations, waiting periods and terms for keeping them in force. Please contact TMA Insurance Trust toll free 1-800-880-8181 for costs and complete details. Insurance coverage is issued by Metropolitan Life Insurance Company, New York, NY 10166.